Luumbar Spine Fusion is an effective treatment option to stabilize the painful motion segment, and may provide indirect decompression of the neural elements, restore lordosis and correct deformity. The surgery involves placement of an implant (cage, spacer or structural graft) within the intervertebral space after discectomy and successful union of two or more vertebra. Posttraumatic cases of segmental instability or potential neurologic injury. Degenerative spinal pathology with failure of conservative treatment. Radiculopathy due to foraminal stenosis. Lumbar degenerative spinal deformity including symptomatic spondylolisthesis and degenerative scoliosis. Confirmatory diagnostic testing often includes MRI scanning and discography for equivocal cases. 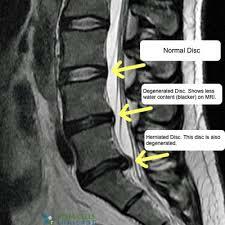 Osteophytes and segmental disc space narrowing in patients with degenerative spondylosis. 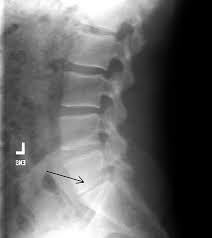 Anterolisthesis, or a forward slippage of one vertebra on the next, is the hallmark radiographic finding in spondylolisthesis. A midline posterior incision, with a laminectomy if necessary. Transverse process, pars interarticularis, and if needed, the sacral alae are decorticated (posterior fusion). then a bone graft is placed on the decorticated surfaces. Pedicle screws and rods or plates may be placed to immobilize the motion segments rigidly and augment the formation of a solid union. In routine cases of posterolateral fusions the disc is not radically resected. Biomechanical studies have shown that people bear load through the middle and posterior thirds of the disc. Several reports describe a persistently painful disc under a solid posterior fusion. A-posterior lumbar fusion (PLIF): associated with a higher incidence of postsurgical nerve injuries. D-Lateral Interbody Fusion: nerve stretch injury reported, with L4 nerve root injury most common. E-Interbody Cages: hollow cylinders made of titanium, carbon ,or bone filled with autogenous bone graft or a bone graft substitute and inserted between the vertebral bodies. A tour of the facility and operating room along with meeting with individuals who have already undergone such a procedure may also help to decrease patient anxiety surrounding the surgery and hospital experience. Therapist must have a complete picture about the procedure, surgical approach and fused levels. Note: During a posterior fusion, the multifidi are retracted from the spine. This partially tears the dorsal divisions of the spinal nerves, resulting in partial denervation of the multifidi. If an anterior fusion also has been performed, then a midline skin incision will be apparent and the abdominal muscular incision is lateral. The incision passes through the obliques, also partially denervating them. For this reason the therapist should teach the patient the proper way to recruit the transverse abdominis (TA), multifidi, and pelvic floor muscles and watch for any substitution patterns to promote proper spinal stabilisation. The evaluation shouldn't include Lumbar ROM or hip flexor mobility especially at first stages of rehabilitation. Most patients are referred for physical therapy anywhere between 4 to 7 weeks after their discharge from the hospital. Physical therapy management during this phase consists of teaching patients the proper way to get in and out of bed, dress and perform other self-care activities, and walk (perhaps with a walker for the first 1 or 2 days). Light TA and pelvic floor contractions to begin to practice them in different positions. The therapist also can teach basic and simple neural mobilization for the nerves involving the lumbosacral plexus. They can begin a light weight-training program, avoiding exercises that inappropriately load the lumbar spine but making sure to include some exercise for the lumbar paraspinals and other muscles that attach to the thoracodorsal fascia. Common restrictions are no lifting greater than 10lb. and no overhead lifting. Patients should extend the knee while lying supine with the spine in a neutral position and the hip flexed to a 90° angle. When tension is encountered, the therapist helps the patient work the knee or ankle gently back and forth, gradually increasing the ROM. This stretch may cause increased symptoms during the stretch, which should resolve immediately on relaxing. Ultrasound shouldn't be applied over a healing bony fusion. Patients with severe pain problems can try using a home transcutaneous electrical nerve stimulation (TENS) unit or interferential unit. Incisional pain can be expected to decrease gradually over 6 to 8 weeks. 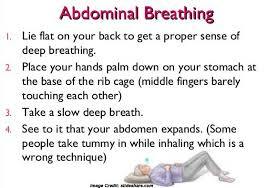 Abdominal bracing and supine marching are good exercises to begin strengthening the trunk. Before bracing is initiated, it is best to make sure the patient can isometrically contract the TA, multifidi, and pelvic floor muscles. 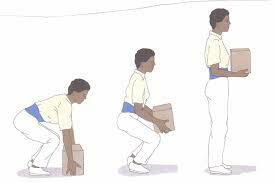 Exercises are recommended to be practiced in sitting, standing, and quadruped. Care should be taken when starting more vigorous strengthening activities, because it is recommended that the patient be able to use the appropriate stabilization muscles during components of the exercise before doing the full exercise. 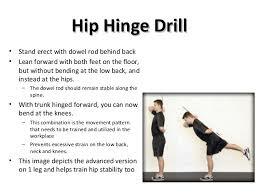 Hip flexors stretching should only start after the permission of the surgeon. stretching should be very gentle and only pushed to the point the patient can brace to prevent lumbar motion. What the therapist is attempting to develop at this stage is not so much muscle power as kinesthetic sense for the muscles and their role in protecting the spine. Therefore the proper form of each exercise should be emphasized. Through soft tissue mobilisation techniques. They often return to work with modified duties or on a part-time schedule. patient should be independent with self-care duties and also with a moderately challenging home exercise program. 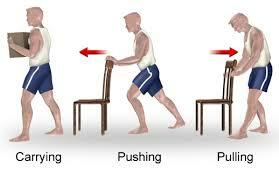 More strenuous stabilization activities, such as half and full front and side planks could be added. The previous trunk stabilization activities should be progressed within the patient tolerance with modifications according to the patient's condition. It is not advised to do complex weight lifting tasks, but to focus on light free weight activity and machine based exercises that allow the patient to perform them with proper posture, technique, and bracing. Patients should be extremely careful with overhead lifting because of the axial load and compressive forces placed on the spine. Endurance and cardiovascular exercises should also be progressed at this stage and start to progress gradually. For some individuals it may be advised to do more cardiovascular or resisted exercises in an aquatic rehabilitation environment. At this stage the expectation is that pain continues to decrease and be at a minimal level. However, if pain persists and the surgeon reported absence of physical explanation, then the therapist should reinforce the functional improvements and minimize the importance of pain as a marker of improvement. Patients should be progressing to full restoration of their pre-injury level of function and be independent with conducting their previous home and gym program. They should have a good grasp of not only the exercises and physical activity required to reach their goals but also ways to modify those activities. Patients with fusions frequently develop problems at the level above or below the fusion. For these reasons, the patient should learn that spinal care is now a lifetime habit and must be maintained with regular exercise and good mechanics during all daily activities. ↑ 2.00 2.01 2.02 2.03 2.04 2.05 2.06 2.07 2.08 2.09 2.10 2.11 Maxey, L. and Magnusson, J. (n.d.). Rehabilitation for the postsurgical orthopedic patient. ↑ Burkus K, et al: Six-year outcomes of anterior lumbar interbody arthrodesis with use of interbody fusion cages and recombinant human bone morphogenic protein-2. J Bone Joint Surg 91:1181-1189, 2009. ↑ Ibrahim T, et al: Surgical versus non-surgical treatment of chronic low back pain: A meta-analysis of randomized trials. Int Orthop 32(7):107- 113, 2006. 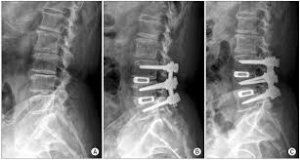 ↑ Knight RQ, et al: Direct lateral lumbar interbody fusion for degenerative conditions: Early complication profile. J Spinal Disord Tech 22(1):34-37, 2009. ↑ Kisner C, Colby LA: Therapeutic exercise: Foundations and techniques, ed 5, Philadelphia, 2007, FA Davis. ↑ Thompson WR, editor: ACSM’s guidelines for exercise testing and prescription, ed 8, American College of Sports Medicine, Baltimore, 2004, Lippincott Williams & Wilkins.